Hi guys , after some days busy i finally get time back to work on my 14 set, i have some doubt here that i need to confirm as these are smd resistors and i dont want to destroy the tv by doing the wrong thing. So as Syntax instructs me i need to replace those 0R bridge resistors with some 100n caps, my doubt is i need to replace just the R,G,B (R320, R321,R322) ones or also the blank YS (R319) one? I just modded a sony very similar to yours and mine had no resisters going to the captioning decoder. All I did was remove it and added some 104 caps and 75ohm resisters to ground and 5v to the YS,cool thing I got to keep the osd as well. Cant thank you enough man thanks thanks! was trying to figure out the thing for hours, so just to confirm the captioning decoder is that "B board" from my pics? i can just discard it and the set still gonna works? No need to put 104 cap on the Blank right? just on the rgb external lines? i not get the cap use can you help me figure out? i found some 104 caps here but they are giant, did you use ceramic? thanks again! No need to put 104 cap on the Blank right? Correct. Only required for the RGB signals. thanks! can i simple route that capacitors to another point like on the jungle pins or on the captioning area? 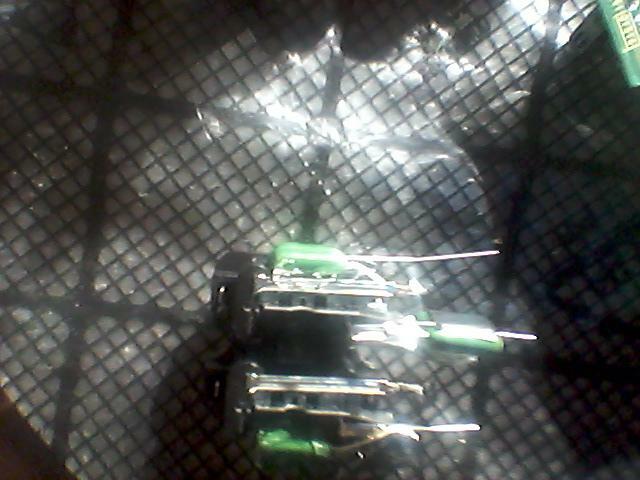 i not have smd capacitors here so im thinking about just remove the 0R resistors and jumper the traces. 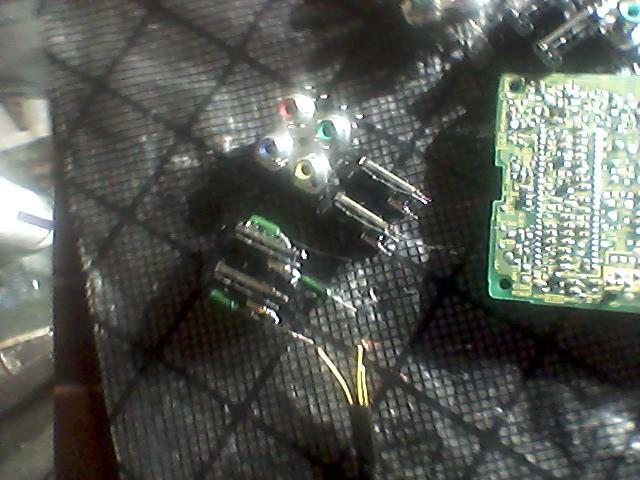 I removed the decoder board and just solderd to the port. As for the smd resisters check to see what value there are,if there 0 ohm I wouldn't even remove them. Got 10K on each of them so im going proceed with the removal.If i let the decoder board i lose OSD? 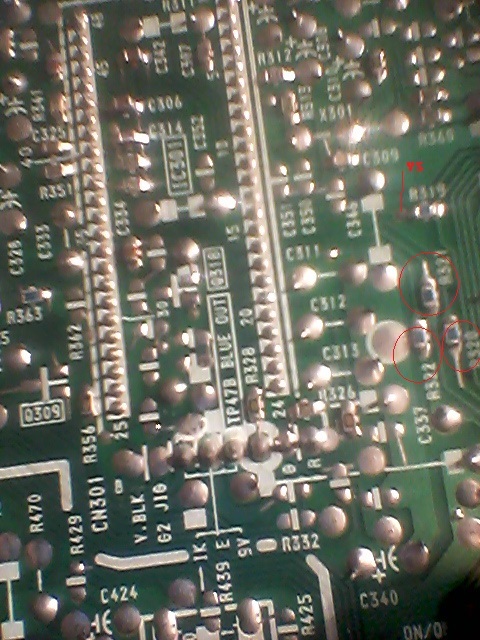 I also got continuity between 9V and 5V points of the board, thats kindda of normal or i short something here? thank you all for the help! Last edited by HellRazor on Mon Jan 28, 2019 10:40 am, edited 1 time in total. Nope,if you look at the CXA1465AS the OSD uses digital rgb. After you remove the board just make sure your getting 5v correctly for blanking. ok, i forget to ask you just to confirm, no need to put any resistor on the dpdt switch right? thank you! 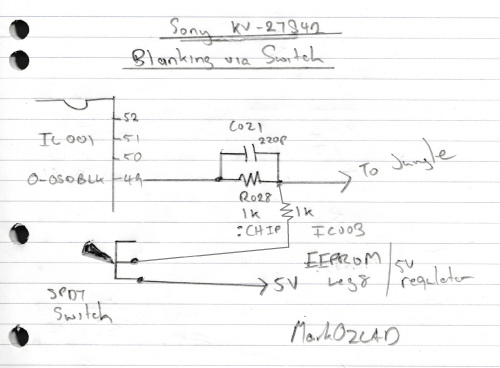 If you mean for blanking then 5v should be fine,it's what I'm using or you can use 5v from your console so you wont even need to wire up a switch. If you mean for blanking then 5v should be fine,it's what I'm using. yes the blanking switch, going solder the wires directly so, thanks again! The picture looked good originally, but I could tell something was off. I had the spdt switch wired with a 1k resistor inline on the blanking side, and that was preventing that switch from having any effect on the image. Basically, I had a composite picture regardless of which way it was switched. I removed the 1k resistor and voila, night and day difference. 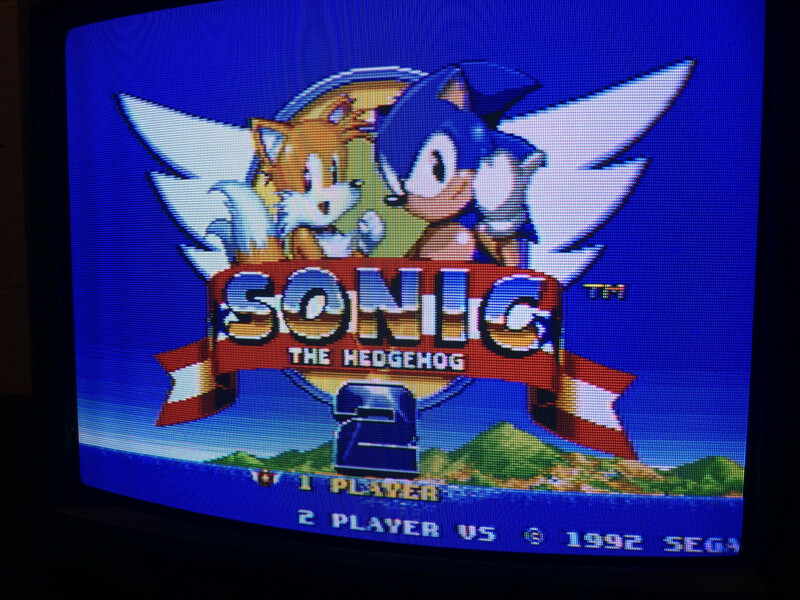 Before and after pics below (Generic Sonic 2 because it's all I have available through SCART at the moment). I realize this is also the problem I was facing on my 27V42, so I'm excited to remove the resistor there and see what difference it makes. Super happy with how this turned out. I do have one question... am I risking anything by using no resistor as mentioned in previous guides on my SPDT switch? This is what I was referencing when seeing that I needed a 1k resistor on the blanking cable. But a 1k doesn't seem to allow the blanking to activate correctly. 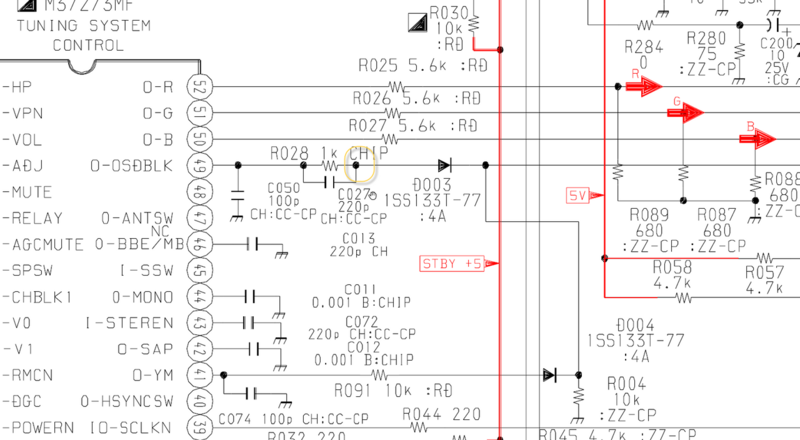 I'm getting 5v off the same pin mentioned in the schematic. Congrats! Those before and after pictures are gold. 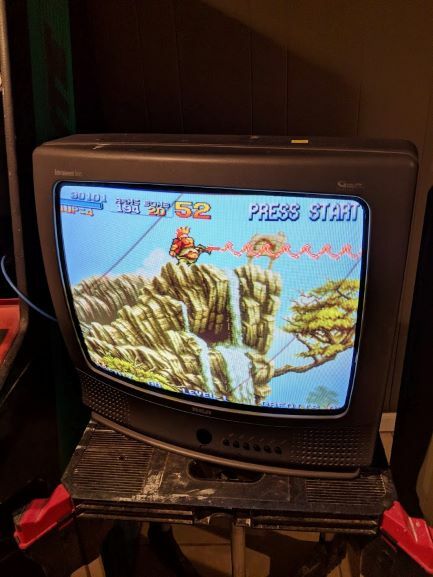 Thanks to all of the input on here, I was able to successfully mod an RCA CTC203 chassis (LA7612N jungle) TV, and have successfully connected both VGA and a Neo Geo MVS1 pcb through the JAMMA connector. 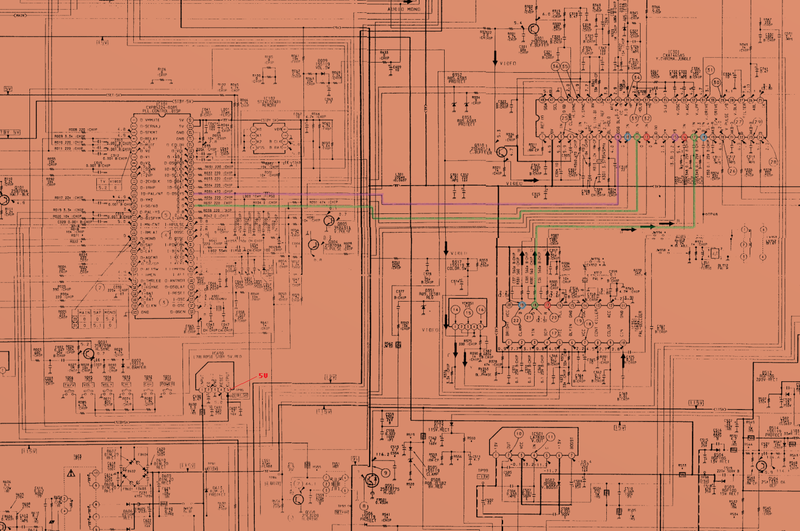 My RGB lines are all terminated according to the specs on the first page (75 ohm resistors to ground and then a ~0.1uF capacitor in series to the RGB input). 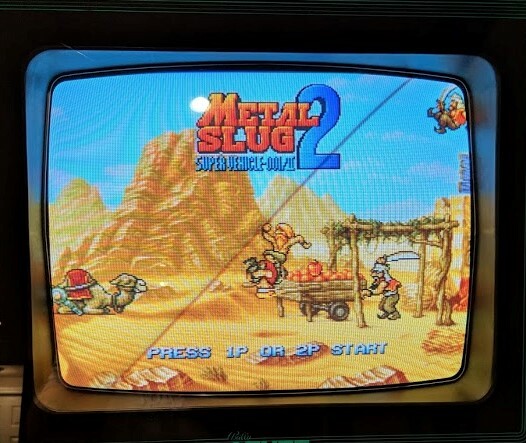 The color is looking outstanding from VGA, and just a tad bright from the Neo Geo board (but just adjusting brightness and contrast in the OSD cleans that up pretty well). I have my sync connected to the composite input. However, I do have some smearing/ghosting from certain colors on certain backgrounds. Also, on certain solid colors, I am getting some vertical "banding?" (see pics). I read that people used in-line caps to clean it, but I don't have a clue what caps I should be using to do this. I also tried soldering sync to pin 38 (Y-in), but all I got was a black screen. 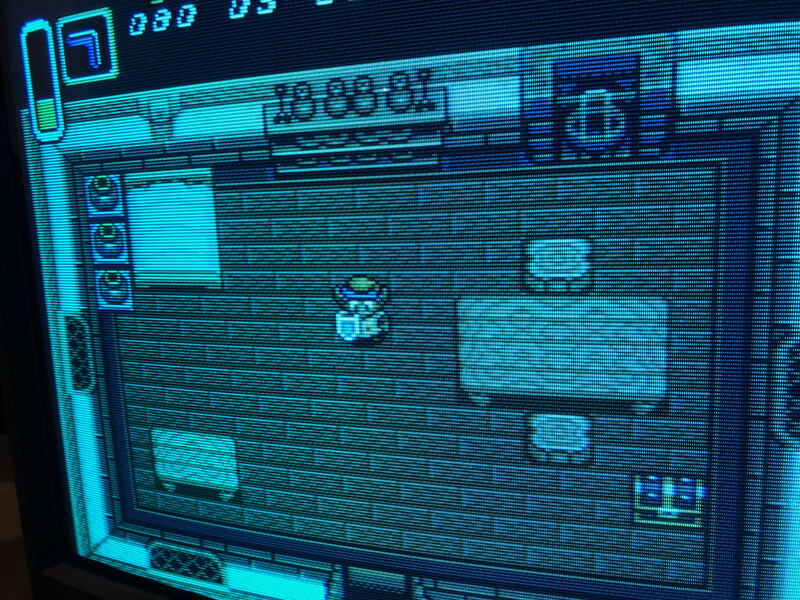 VGA syncs immediately, the MVS board looks scrambled for < 1 sec, then syncs very well. On occasion, the entire screen will jump slightly to the right (maybe a quarter of an inch), and randomly pop back to the original position. It doesn't happen often enough for me to want to go back to my extremely burnt-in Electrohome G07 chassis/tube though The clarity of the picture is just a night and day difference! I did leave everything between the OSD chip and the jungle chip, with a toggle switch on blanking so I can still access the menu. I soldered RGB (with the cap and resister to ground) directly to the jungle on pins 34 (red), 35 (green), and 36 (blue), and sync to the board where the composite jack's leg goes. Is there a better place to inject the sync signal than composite for me? And is leaving the OSD connected to the RGB pins on the jungle causing the interference? Last of all, thank you everyone for sharing your setups and wisdom. I couldn't have done this without this forum! Last edited by jkchr1s on Sun Feb 03, 2019 12:48 am, edited 1 time in total. 27V42, almost there. Solved the blanking issue. Again, as was the case with the 13" on the BA-4D, no resistor required on the blanking signal from the R28 to the switch. Removing that allows the switch to turn the SCART port to RGB mode. Anyone who has input on whether this is safe to run this 5V voltage without a resistor or another value might work better, please let me know. But in my limited testing so far, it holds up fine. I now have G and B, but no R. I think this one should be easy to troubleshoot. There's another person in this thread that had a similar issue, I just need to browse through the entire thread to find the possible solutions (I assume the R line is being interfered with, came loose, something of that sort). Still though, super clear on the sharpness, night and day from composite. Can't wait to see how this looks when I solve the Red issue. So that miss of red color can be related to the tv too? Wouldn't think so in this case, think it's my wiring. Red and all colors display fine when you flip the blanking switch back to composite. So it's only in direct RGB mode there's a problem. I have good soldering skills as I modded a bunch of consoles but I need some tips regarding where i have to solder things and which resistors my be needed. Sony 27V42, opened it up, redid all the wiring entirely more cleanly and carefully. Still have no red in the picture. The only connection I didn't redo is the connection from red to the resistor on R26, so I guess I'll have to pull that up and see what's up there. 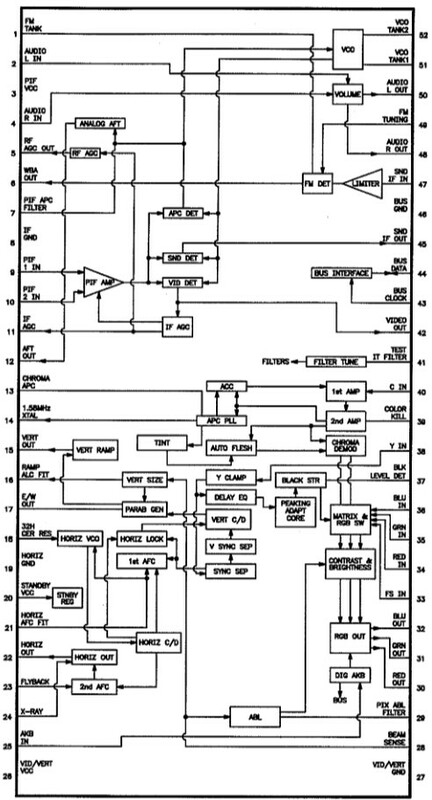 Okay so I have this CRT that has TTL OSD RGB inputs BUT lists in the chassis service manual as being able to support SCART. 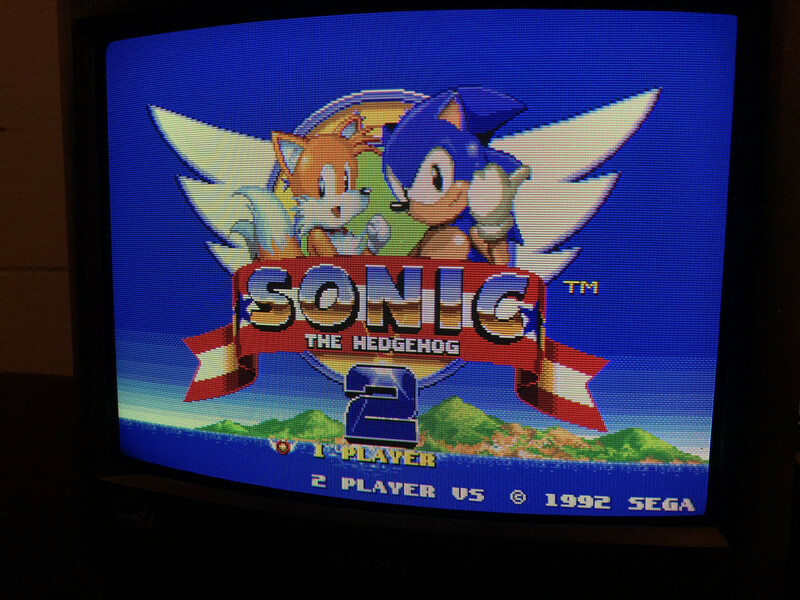 I remember reading a year or so ago about a CRT mod where they enabled the SCART setting and fitted a connection. Found the chassis service manual and looks like it can support Scart in and Scart out but doesn't come hooked up on USA models. 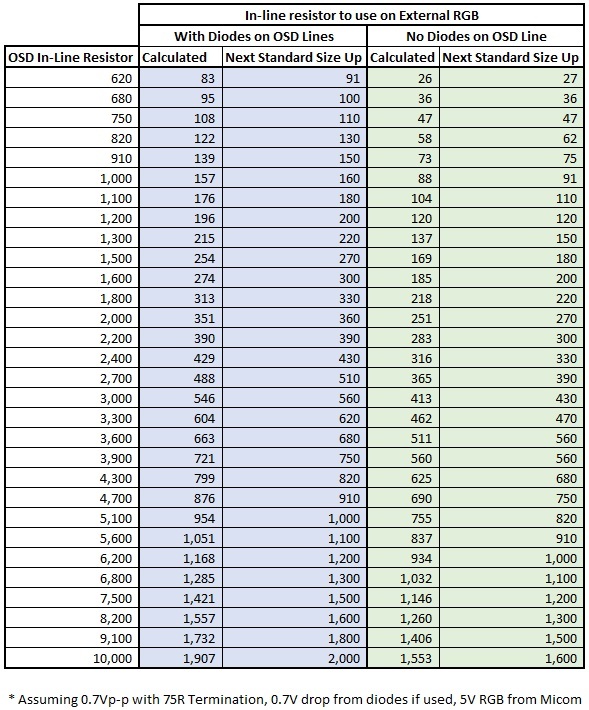 Page 117 describes how UOC (7200) can have the these two connections enabled. Okay so Pin1 on the jungle ic looks like it controls weather SCART is enabled or not. On USA models they use YUV inputs and I'm guessing those same inputs can also be switched to analog rgb inputs. Looks like in this section it says these inputs can either handle RGB or YUV depending on the STATUS1 state. It also shows 22nf caps if using YUV specifically so this leads me to believe it can handle RGB signals depending on the status of STATE1. Probably just jump those caps out. In the next picture below it shows how PIN1 is for STATUS1 and if using YUV there is a 100 ohm resistor inline, which mine has. For optional RGB it has a weird symbol, but I think it means just a straight jump to pin 1 jumping the resistor. What do you guys think? I believe you will need to work out how to set the service menu option bits to enable RGB. Maybe need to find out the model number of a TV with same chassis but with Scart and then identify which option bit has to be changed. The service manual doesn't say what bits do what. I think I had figured out the no red issue on my mod. I pulled the board, re-soldered the ext Red after the inline resistor just to make sure the connection was good. Flipped the board over and took a look at the R86 resistor on the back, and there was solder bridging where the resistor used to be. Cleaned that up nice. Put the board back into the set, no power. Took it out, inspected, re-plugged in everything... no power. 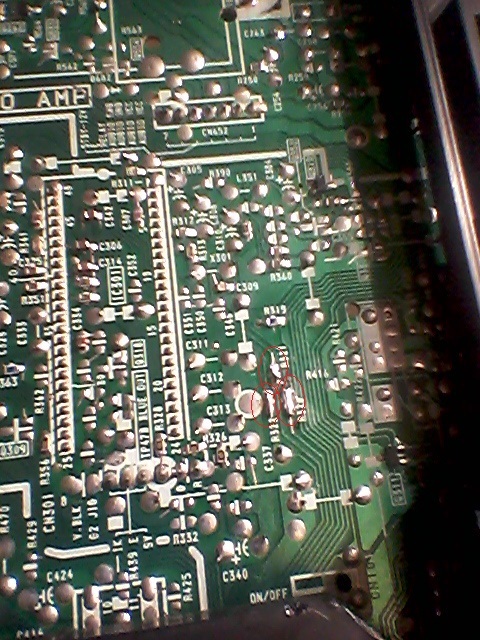 Took it out again, took a closer look, and found this on the HV section of the board where the power button cable leads. The pic is before I cleaned up most of the white goo on top of the cap. It's not adhesive, I can clean it up with a paper towel (it wipes off, it's not solid). It was all down the side and over on the metal wall nearby too. 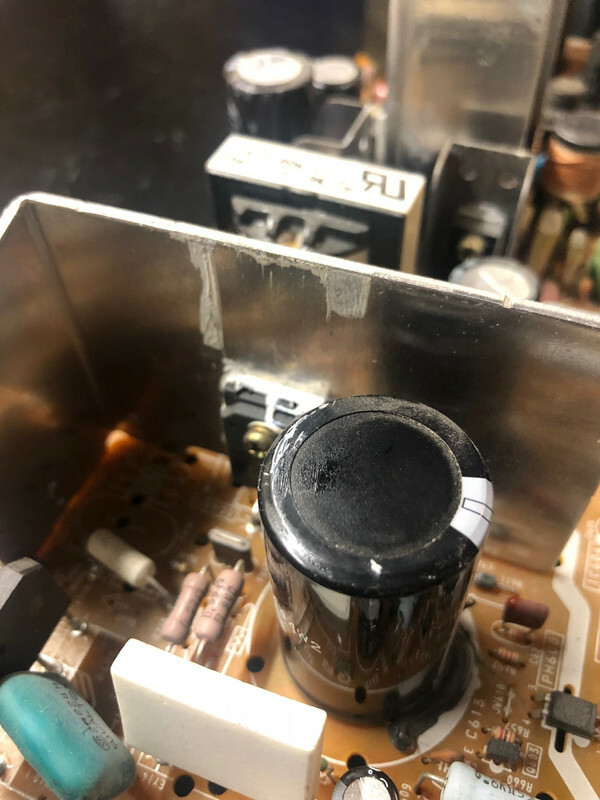 I'm not sure I've seen a blown capacitor where the cap wasn't bulging or burst, and the black on the bottom looks like adhesive to me, but I could be wrong on that. Need an expert opinion, is this my problem? I have seen adhesive used in those spots before, I believe you are correct. I have seen adhesive use in those spots before, I believe you are correct. 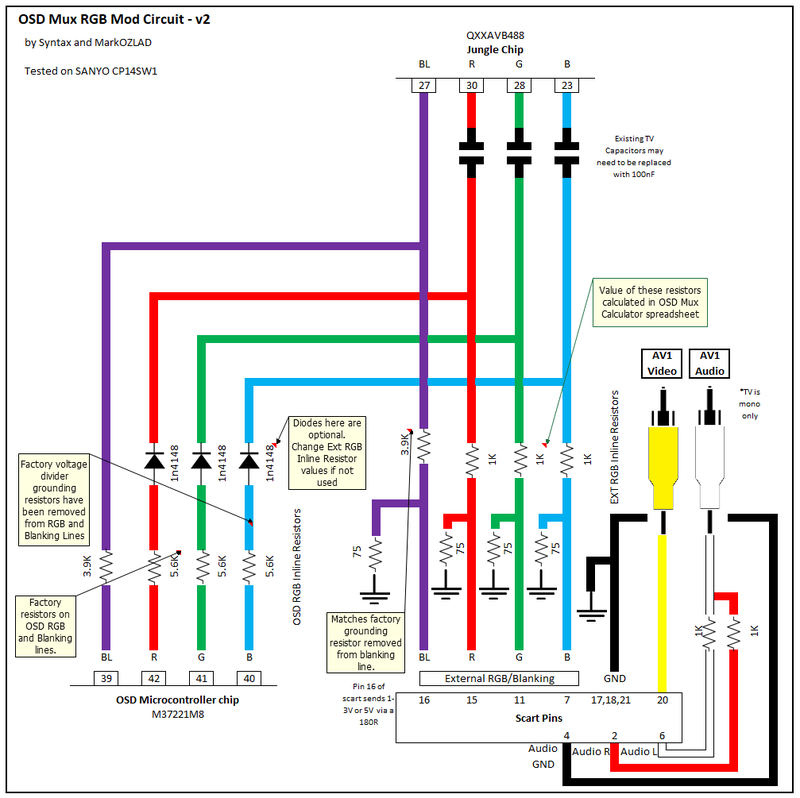 I found a service manual with option bits but doesn't look like anything there for RGB SCART. I still think it's possible that Status1 pin could control if the inputs are YUV or RGB. I found this extra info about Satus1 and Satus2 pins in a Phillips Euro chassis that uses the same chip. 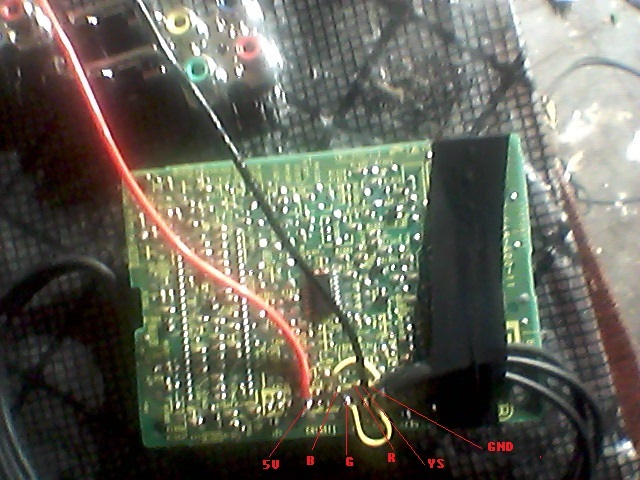 the SCART1 AV input and output port. this line ‘high’ while a CVBS source makes the line ‘low’. So I'm guessing it's getting 0v to 2v as is so if I jump something in the range of 9.5v to 12v it will process as RGB. Not sure though, where's Voultar when you need him? Hopefully it adjusts how the YUV or RGB signal is process and isn't just a status on the OSD that is changed. Anyone have any any more insight before I attempt? That will only force AV input and 4:3. Well I bypassed all the YUV/RGB circuitry and jumped the YUV inputs to the YUV/RGB input pins on the chip. I'm getting Red and Green okay but blue looks purplish and it's out of sync. No sync on composite either. Probably just going to give up on this and find one with analog rgb. I have some banding that shows up on dark screens, as well as some ghosting where there is a bar or something solid color. I'm using composite input for sync (and I cannot find another place to insert it on my board). I tried to find what "clean" the sync signal means, but this is quite a long thread! Do I need to put a cap and resisters inline like I did with the RGB signal? I had a longer post with more details, but for some reason it didn't show up.